My brother of Budgettraveller.org fame is visiting us this week. We will be going on a mini-holiday with him to the island of Martha’s Vineyard. As usual, it’s more about preparing for the trip for me. I like to plan, make lists of things I would like to do, see and eat on the trip… and there is one thing you should know about me. I love stationery. 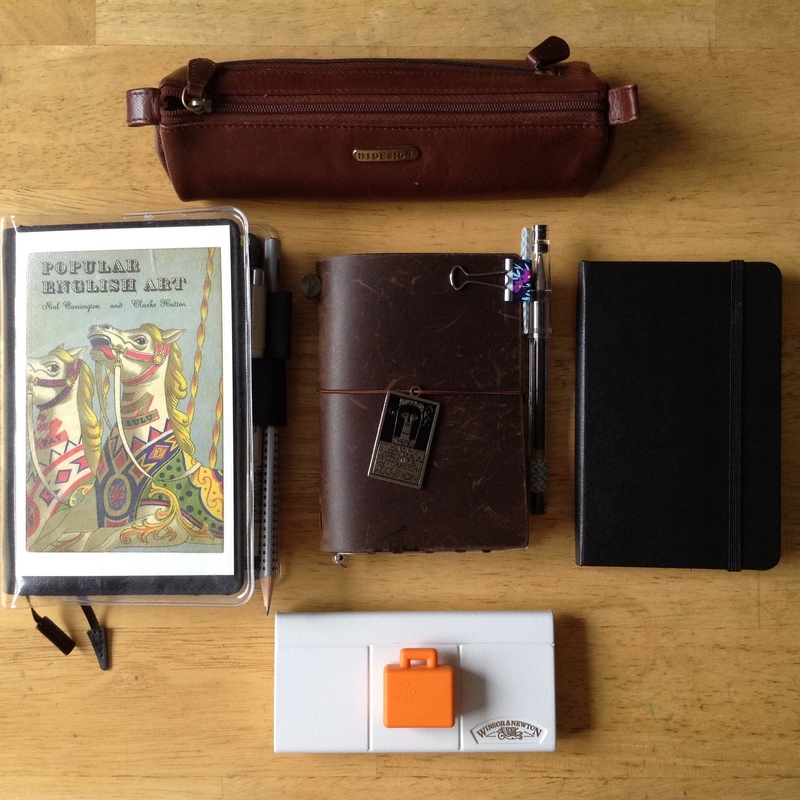 Notebooks, pens, pencils, erasers, rulers, pencil pouches- I love them all. 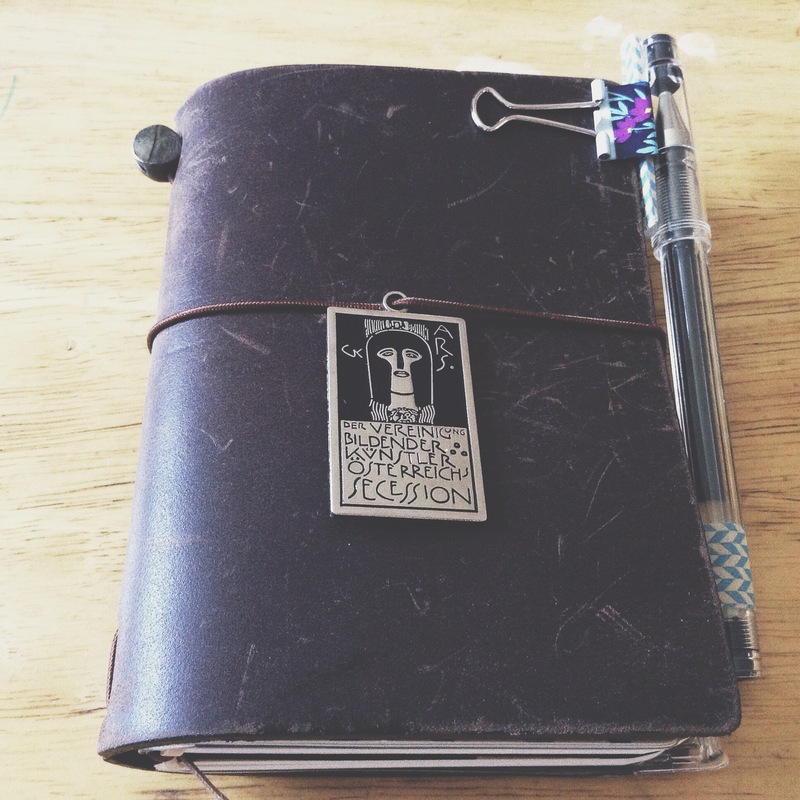 This is the first trip on which I will be using my Midori Traveler’s Notebook or MTN for short. It looks like this. Basically, its a piece of beautiful dark brown leather that can house several small notebooks that you can take on your travels with you or use at home. One of the three notebooks I have inside has a long list of things to do in Martha’s Vineyard. Of course there’s a section devoted to the bookshops and public libraries on the island ( typical of me and my priorites in life). Something else that I am planning are the art supplies that I want to take with me. Here’s what I am thinking: my mtn, the hobonichi for journaling which I have neglected in the past week, a moleskine sketchbook and a Winsor and Newton pocket paint palette. Oh, and the little orange suitcase is a tiny receptacle for holding paint water! 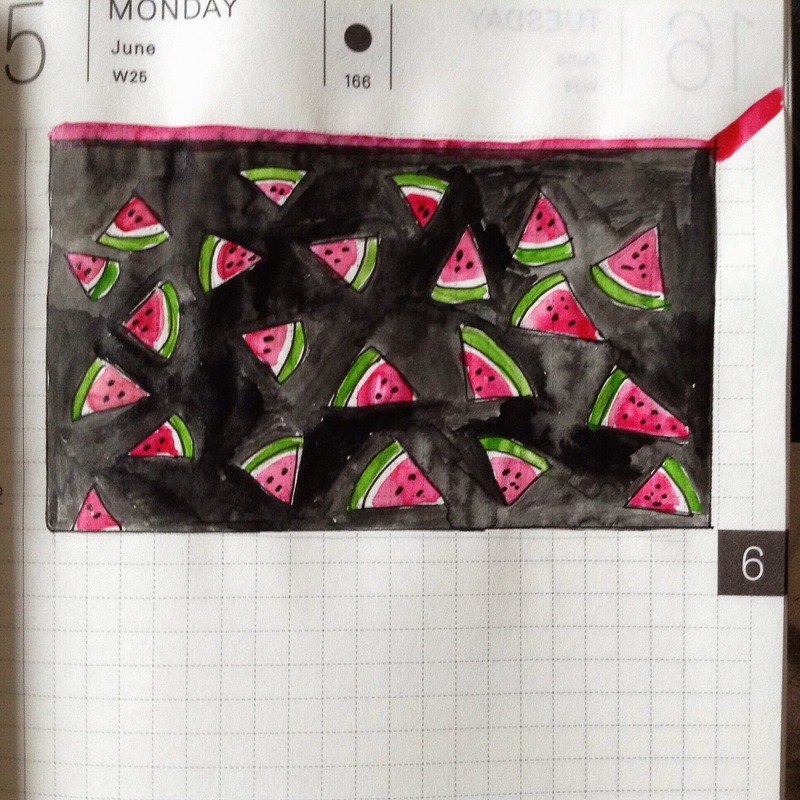 Something else that I am currently obsessed with is my summery watermelon pouch, immortalized forever in my art journal. I am planning to take Peter Mayle’s A Year in Provence with me. I am reading a chapter a month throughout this year and have April, May and June to catch up with. It’s the perfect book to take on travels. 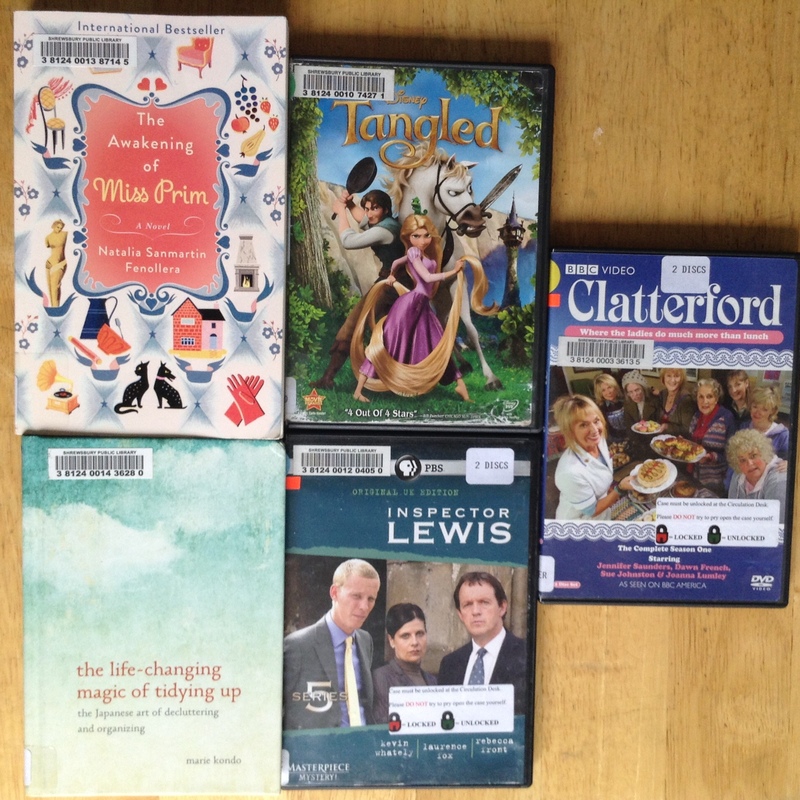 Here is the library haul for this week. Sometimes books on my ‘to be read ‘ list are very much pre-meditated. Sometimes, though, visiting the ‘New in Fiction’ book shelf at the library can be a very dangerous place for me. Especially if the blurb on the back seems interesting, and the front cover is appealing- you will find the book quickly disappearing into my library book bag. The Awakening of Miss Prim by Natalia Sanmartin Fenollera- had me in two seconds. Briefly the book is about Prudence Prim, a young woman who accepts a position as a librarian in the village of San Ireneo de Arnois and quite unexpectedly finds love. A young woman, a rural foreign setting, mentions of tea, cake and libraries – it was all more than I could resist. Can’t wait to start this book. I have been on the waiting list to read The Life Changing Magic of Tidying Up by Marie Kondo since the beginning of this year. I was requester number 556 on the long list and this week my luck changed and it was my turn to take the book home. I’m not really in the mood for spring cleaning at the moment but I will give the book a quick lookover, given the great popularity that surrounds it at the moment. Inspector Lewis is a great detective series that I thought we could watch together in the evenings at Martha’s Vineyard. I’ve not seen or heard anything about Clatterford, but it is a BBC production and therefore in my eyes can do no wrong. Tangled- well it is a great favorite of Little M’s especially since she has a Rapunzel or ‘Funzel’ nightdress now. The poor DVD spends more time at our house than on the library shelves! Till next week, when I will hopefully bring back travel tales, farewell friends!